• Saffron colour - pinch. • Cream - 2 tablespoons. • Pomegranite seeds - 1/2 cup. • Pineapple - 1/2 cup. • Coriander leaves - 1 bunch. • Coriander powder - 1/2 tea spoon. • Green chilles - 4 number. • Whole grama masala - 2 number. • Bay leaf - 2 number. • Oil - 1 tablespoon. • Onion - 1 number. • Almonds - 10 number. • Rasins - 1 tablespoon. • Cashew nuts - 1/2 cup. • Califlower - 1 cup. • Paneer - 1 cup. • Beans - 1 cup. • Carrot - 1 cup. • Potatoes - 1 cup. • Black pepper powder - 1 tea spoon. Take a pan add some water bring it to boil and then add cashew nuts, onions chopped cook till this is tender then blend in blender keep aside. Now in another pan add enough water to boil potatoes, carrot, beans, add salt cook till these vegetables are half cooked then add cauliflower once vegetables are tender remove from the flame and keep it aside. 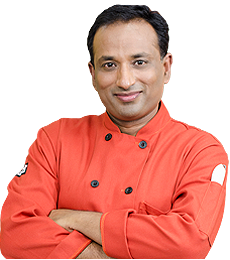 In a pan add oil Bay leaf, whole garam masala, jeera, ginger garlic paste, then add cashew nut and onion paste mix well then add green chili chopped, coriander powder, and cook till oil oozes out, now you can add little water, bring to boil. Now add boiled vegetables, fried paneer, dry fruits slightly fried, raisins, pineapple, salt, cream, color, pepper, cook for 10 minutes. Lastly, add pomegranate seeds and coriander leaves chopped. Navrattan korma is a classic delicious Mughlai dish with veggies incorporated for health benefits. Navratan Korma, like the catchy title not all dishes in I... Read More..
Navratan Korma, like the catchy title not all dishes in India is called the curries. This has an exotic and wonderful name where Navratan means the Nine Jewels which is a delightful mix of several different ingredients, all of which come together to whip up a beautiful delicacy. In other words this dish is also popularly known as Vegetable Korma, a combination of several vegetables cooked in a creamy silky sauce. This is a dish which is not too spicy and is a little mild but can be modified according the individual’s taste. It is often served in most of the Indian restaurants. Korma is a dish that goes well with any Indian bread or rice. Korma is also spelled as qorma, khorma or kurma, a dish that originated from Central Asia or Western Asia which is made with yoghurt, cream, nuts or coconut milk. The korma can either be vegetarian or non-vegetarian. Korma has its roots in the Mughlai cuisine of modern day India and Pakistan. Korma basically means rich thick gravy. The word Korma is a Persian word and was brought into the Indian culture by the Mughals. Korma is usually served with Jeera rice or Cumin flavored rice. Classically, a korma is defined as a dish where meat or vegetables are braised with water, stock, and yoghurt or cream. The technique covers many different styles of korma. The Navaratan Korma is made by using 5 varieties of vegetables like the carrots, beans, cauliflower, peas, potatoes, paneer (Indian cheese) cooked in a onion and cashew nut gravy and cream is added to give a richness to the gravy and enhance its tastes. You can also add pineapple pieces and garnish with pomegranate seeds in the last. Truly a colorful sumptuous and aromatic silky sauce that would linger your taste buds. 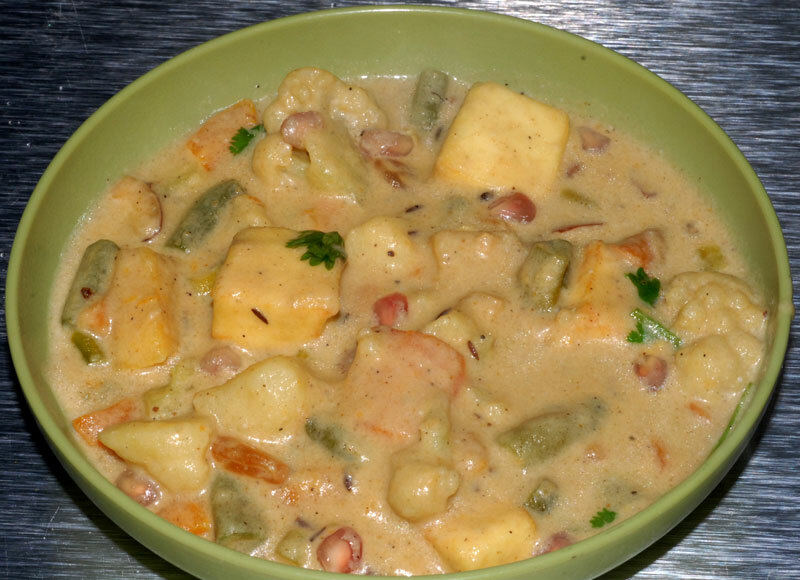 It is assorted vegetables cooked in a creamy white sauce/gravy, flavored with spices. It tastes is amazing. It ensures that most of the nutrients in the vegetables are retained. The sauce will get the perfect aroma when all ingredients are used. It goes very well with hot naan and jeera rice. Traditionally this dish comes from a Mughlai origin giving it a very rich and slightly sweet taste. This is an absolutely delicious recipe and for all those who are not so fond of spicy Indian food, this should be a welcome change to enlighten their taste buds. This dish is a vegetarian korma made with vegetables and either paneer (cottage cheese) or nuts - or sometimes both. This low cooking temperature is usually quite difficult to achieve, but if done correctly results in a memorable dish. There is a wide variation between individual korma and other "curry" recipes. Chilli and ginger are often used, but the precise method of preparation results in widely different flavors. For preparing this delectable dish take a pan add some water bring it to boil and then add cashew nuts, chopped onions cook till this is tender then blend in blender and keep aside. Now in another pan add enough water to boil add chopped potatoes, carrot, beans, add salt cook till these vegetables are half cooked then add cauliflower and once the vegetables are tender remove from the flame and keep it a side. In pan add oil Bay leaf, whole garam masala, cumin seeds, ginger garlic paste then add cashew nut and onion paste mix well then add chopped green chilli, coriander powder, and cook till oil oozes out, now you can add little water, bring to boil. 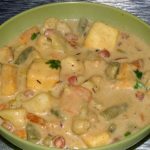 Add the boiled vegetables, fried paneer, slightly fried dry fruits, raisins, chopped pineapple, salt, cream, black pepper powder and cook for 10 min. Switch off the flame and lastly add pomegranate seeds and finely chopped coriander leaves. Unlike most Indian gravies, this recipe is not very spicy due to use of certain ingredients such as pineapple, raisins, and pomegranate seeds and nuts. There are many recipes available to make Navratan Korma, this one presented here is one of the simplest way to make it. However you can select the ingredients as per your taste. In true Mughlai cuisine fashion, cream (or cashew nut paste) is added to form the gravy. This recipe is very rich and slightly sweet in taste and becomes a wonderful delicacy of any occasion or party. It’s a pure vegetarian dish which could certainly impress our vegetarian guests. Awesome. Definitely one of my favorite dishes. On my "to-cook" list! Aah....!!!! This is indeed a delicious dish. very well made and never thought that there are so less 'masalas' in this dish. I always thought its a mixture of loads of masalas and stuff when I ate it in the restaurant. Brilliant!!!! Yummmm.... this sounds like something I can try!!!! If you only knew how much Ive been looking forward to this recipe. Thanks Chef!! What was it after boiled vegetables? Fried Oni? What is that? that is fried paneer(cottage cheez) and nuts..
maaan. your pinch of spices are large... they're more like Tablespoons. ^^ this dish looks delicious.